LP-PRE is based on London Power's STANDARD Preamplifier presented in our book The Ultimate Tone (TUT) and used our own amp line. The clean channel is distinctly warm and "North American", à la Fender. The lead channel can be tailored for a wide variety of crunch and distortion sounds, up to 1970s saturation levels - anything from Marshall crunch to "modified" saturation. Any 12A_7 types can be used, with maximum gain achieved by fitting two 12AX7s. Local supply decoupling is included. Channel switching can be provided by use of our Electronic Relay Kit (ERK), or through use of two of our RLY relay kits. Use our PSU-PRE Preamp Power Supply or similar to build a stand-alone preamp. 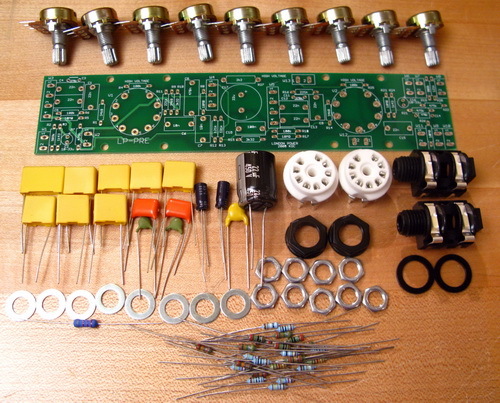 This item includes PCB, tube sockets and components, and helpful installation notes including layout and schematic diagrams of the kit.